Jason Wu kicked off New York Fashion Week with a feline flourish, marking the beginning of a modern military look which is set to continue throughout the entire season. Leather trench coats held oversized fur collars and super cinched waists, while metallic brocade prints were present in Mandarin cut out dresses and restricting military style jackets. 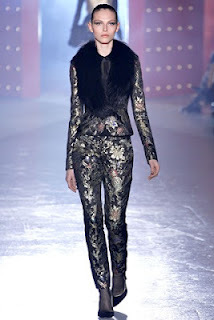 Showing glimpses of inspiration from his Chinese heritage, Wu offered an ultra modern, sleek femme fatale statement for Autumn/Winter 2012, styled with studded leather accessories, blacked out circle frames and super high ponytails; the collection screams bond girl chic. Love it!